Do you want to find the fastest DNS server? Well, today I am back with 3 best DNS benchmarking tools to find fast and reliable DNS server. Every website you access on the internet has an IP address. It is tough to remember the IP addresses of all the sites you want to access, so we visit a website by typing its domain name or hostname. DNS (Domain Name System) is just a collection of databases which translates hostnames to IP addresses. For surfing through the internet, a default DNS server is provided by the Internet Service Provider. Most people use the default DNS servers provided by the ISP. 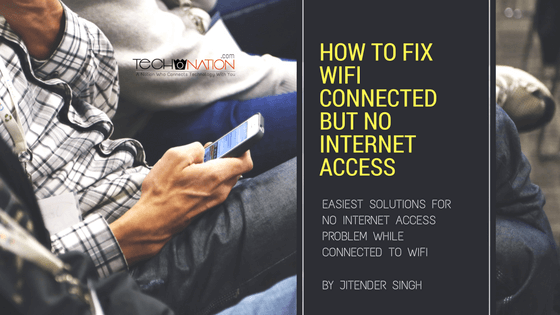 But, for better security, connectivity, and reliability, it is recommended to choose the correct DNS server as per your choice and need. Using an overloaded or unreliable DNS server will significantly slow down your internet usage. I have also shared these best Rainmeter Skins for Windows. 1.1.1 How to Use It? 1.2.1 How to Use DNS Jumper? 1.3.1 How to Use Namebench? You can choose the perfect DNS from OpenDNS or Google Public DNS. But, you need to test the reliability, speed, and security of the DNS server with the help of DNS Benchmarking tool. The best DNS server will be selected depending on various factors like geographical location, ISP, etc. 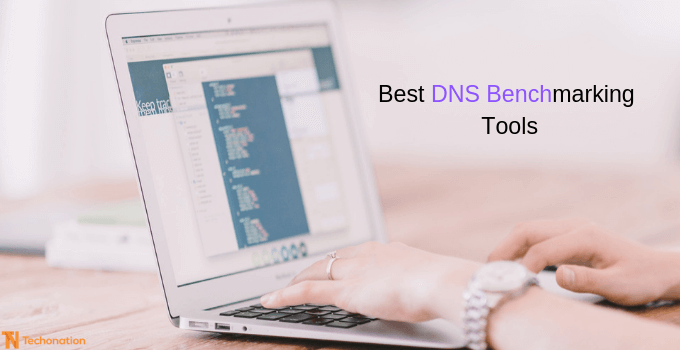 It might be difficult to find the right benchmarking tool, so we have compiled a list of best DNS Benchmarking tools to know the best DNS server. Developed by Gibson Research Corporation, DNS Benchmark is one of the best DNS benchmarking tools available on the internet. It has a neat and simple UI that can be easily used by complete beginners. This utility tool provides its user a detailed report about the DNS server, enabling the user to find the suitable DNS server. This tool shows the minimum response time, average response time, maximum response time, reliability and standard deviation of the DNS servers. DNS Benchmark is a reliable software used by professionals. GNC’s DNS Benchmark is a lightweight software. You can download and start using it without installation. It is compatible with Windows and can be used on Linux and MacOS using Wine (Windows Emulator). It checks the performance of up to DNS servers, providing a comprehensive analysis of all the servers. It can also verify the security of the DNS nameservers and provide DNSSEC (Domain Name System Security Extensions) authentication. After downloading the tool, launch it on your PC and tap on the “Nameservers” tab to select it. This tab has four sub-tabs which are Name, Owner, Status and Response Time. The sub-tabs determines the contents of the third column. The content of the first two columns is IP address and status indicators respectively. Then click on “Run benchmark,” which will start the benchmarking process. It analyses the top 72 DNS servers and offers to benchmark about 5000 DNS servers. It will need a few minutes to find the best server based on your geographical area and Internet Service Provider. After the tests are completed, the tool will show a detailed analysis of the fastest and the most reliable server. Tap on the “Tabular Data” tab to check Cached Name, Uncached Name and DotCom Lookup to get better results. Clicking on the “Add/Remove” button will allow you to add the best DNS server. It is a handy tool for people who are concerned with speed and security. DNS Benchmark is a freeware, and you can download it from their official site. 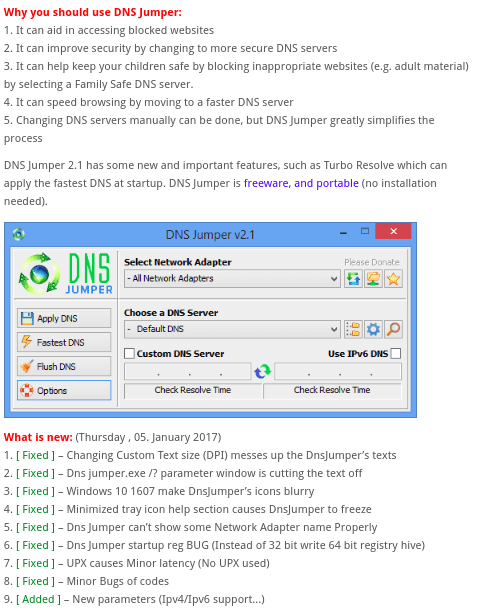 Developed by Sordum, you can use DNS Jumper without installation. It is a feature-rich and one of the best DNS benchmarking tools available for different platforms. It is quite simple to operate tool and beginners can use it easily. DNS Jumper allows users to improve the browsing speed and security by finding the perfect DNS for the user. Sordum is an open-source developer and provides high-quality software for free. It offers some incredible features like accessing blocked websites, blocking websites with inappropriate content and more. It is considered to be one of the best tools for finding the best DNS for your network. The size of the file is less than 1 MB which makes it pretty lightweight. It has a neat and somewhat traditional GUI. It has a collection of DNS servers available for different regions, making it suitable for devices all over the world. How to Use DNS Jumper? Download the tool and then launch it on your PC. Tap on “Fastest DNS” to start DNS benchmarking, which starts a task that might require a few minutes for completion. You can click on the “Mixed” checkbox for selecting different DNS addresses for better speed and reliability. DNS Jumper allows you to enter custom DNS servers and check the response time. It lets you create groups of DNS servers so that you can use it for different purposes. Security and speed is DNS Jumper’s top priority, and hence it lets you block and unblock DNS servers. Unlike DNS Benchmark, this tool does not show a graphical representation of the analysis. 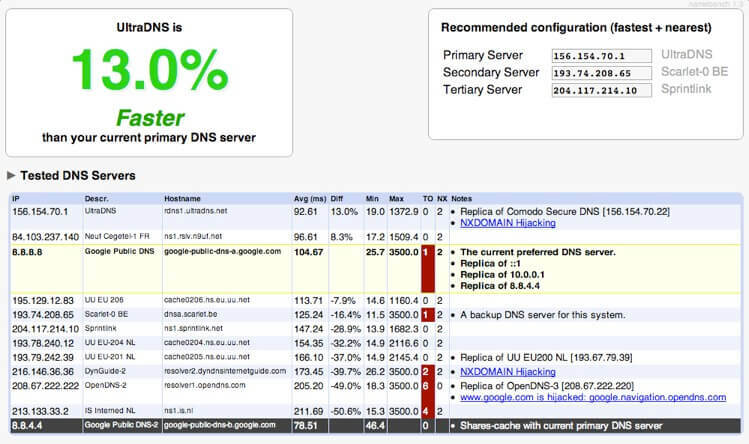 DNS Jumper is an impressive benchmarking tool with useful features. It is worth giving a shot, as you are guaranteed to be pleased with its effectiveness. You can download the DNS Jumper from this link. This software is considered to be one of the best and is one of the most reliable & oldest DNS benchmarking tools. Google made this utility tool under the 20% project. 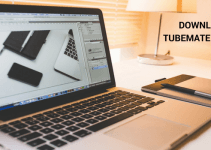 It is an open-source portable software which runs on Windows, Linux and OS X. This tool benchmarks DNS servers using browser history, tcpdump output and provides the best results according to your location. It is easy to use, offering a neat and straightforward Graphical User Interface. Namebench includes DNS servers from Google Public DNS, Comodo Secure DNS, OpenDNS, UltraDNS, RoadRunner, and more. 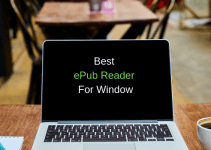 It packs a handful of features, including censorship checks, blocking and unblocking DNS servers, detailed reports, and graphs of the results, and more. You can change different settings and customize your location, check data source, health check, etc. It also allows you to enter a DNS server of your own choice and include it in the benchmark. It also allows you to detect if the Internet Service Provider is overlooking your custom DNS server. Similar to DNS Benchmark and DNS Jumper, this tool can be used without installing it on your drive. Download Namebench and launch the executable file. Enter a server in the “Nameservers” textbox. It allows you to include global DNS providers, best available regional DNS services and also censorship checks. Enter a value in the “Number of queries” and “Number of runs” as per your choice. After following all the required steps tap on “Start Benchmark.” You need to wait patiently, as this task will require a few minutes to complete. After completion, you will get a detailed report of the results. The report will feature the reliable and fastest server for your geographical area. The tool offers a graphical representation and an Excel sheet of all the analysis. Namebench has problems with few networks and has limited configuration options. This tool is suited for users who want a detailed analysis of the different DNS server and simple to use. Barring few drawbacks, this tool is pretty impressive and allows its user to choose the fastest and most secured DNS server. 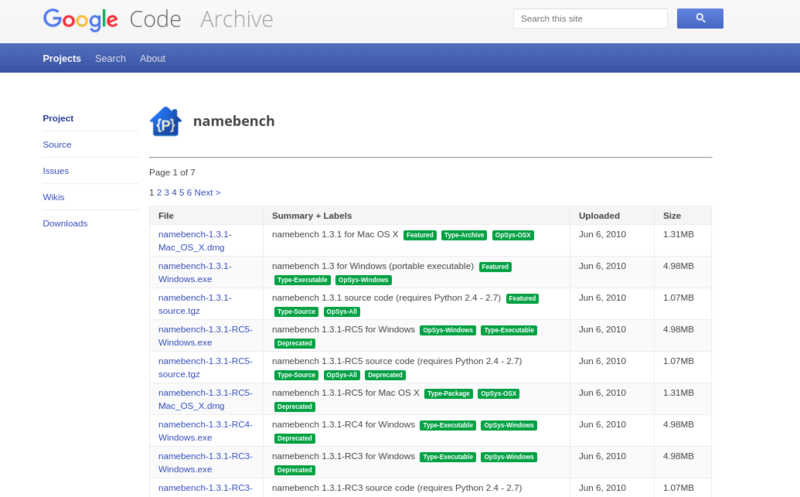 You can download Namebench from this link. Well, that was all for best DNS Benchmarking tools for Windows, Linux and more. All the tools mentioned above are quite similar in functionality and are pretty good in benchmarking DNS servers. If you are looking for software which will occupy less storage space, check out DNS Benchmark and DNS Jumper. 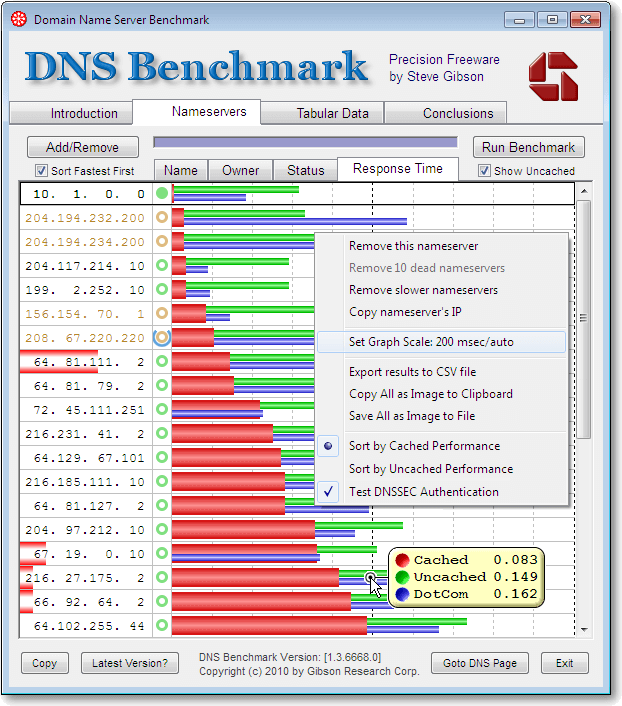 If you want a graphical representation of the results, then opt for DNS Benchmark or Namebench. Here are some great DNS server selection tools, which are worth mentioning- OpenDNS Home, Tweaking.com, QuickSetDNS, and Smart DNS Changer. Check these tools out for better browsing and security.